Today is the start of the annual "Secret City Festival" in Oak Ridge, a two-day party with games, crafts, food and public tours of the three Manhattan Project sites. 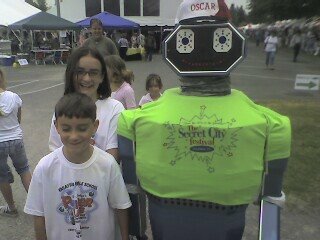 The kids were welcomed by Oscar the Robot, who was far more aware of its surroundings than your normal automaton! Other Festival activities include bands (including a concert by one of The Supremes tomorrow night), bungee trampolines, and a World War II reenactment.